A review of Soviet Citizens Under German Occupation: Life, Death, and Power in Northwest Russia, 1941–1944, by Johannes Due Enstad. Studies of civilian life under Nazi occupation during the Second World War have been framed traditionally in terms of collaboration and resistance. Written from the perspective of the nation-state and embedded in myths of heroism and collective resistance (or the reverse—treasonous cooperation), many of these studies are laden with moral implications about loyalty to the nation and ex post facto considerations of treason and heroism. (See, for example: Werner Rings, Life with the Enemy: Collaboration and Resistance in Hitler’s Europe, 1939-1945. London: Weidenfeld and Nicolson, 1982; Roderick Kedward, Occupied France: Collaboration and Resistance, 1940-1944. Oxford: Wiley-Blackwell, 1985; and David Gaunt, Paul A. Levine, and Laura Palosuo, Collaboration and Resistance during the Holocaust: Belarus, Estonia, Latvia, Lithuania. Bern: Peter Lang, 2004, among others). Shifting away from the collaboration/resistance framework, Johannes Due Enstad’s ambitious dissertation, Soviet Citizens under German Occupation: Life, Death, and Power in Northwest Russia, 1941–1944 is a study of everyday life during occupation in terms of what he calls ordinary Soviet citizens’ “engagements with power”—that is, the ways in which Soviet citizens adapted to new configurations of power—both Nazi and Soviet (p. 218). Rather than focus on directives from Moscow and Berlin, Nazi administrators’ plans for occupation, or the movement of troops along the front lines, Enstad tells the story of how Soviet citizens in northwest Russia understood the occupation, the Stalinist order that had preceded it, and their possibilities for action, both within these competing systems and in the spaces outside their control. The dissertation is structured in eight chronological-thematic chapters. The first body chapter, “Everyday Stalinism in Northwest Russia,” provides background on the social and political context of northwest Russia on the eve of the German invasion. Enstad focuses on the impact of Stalinism (particularly the forced collectivization of the peasantry and “dekulakization” of wealthier peasants), the urban experience in larger towns and cities, and the consequences of the terror in the late 1930s on the population’s attitudes toward the regime. Enstad shows how, on the eve of the German invasion in 1941, Bolshevism had not permeated deeply into the hearts and minds of most ordinary Soviet citizens living in the region outside of Moscow and Leningrad. While some beneficiaries of the regime, especially the younger generations living in urban areas, became “true believers” and felt loyalty to the Soviet state (either as beneficiaries of social mobility policies or as converts to the Marxist-Leninist interpretation of history), the majority of the population, including most of the recently-collectivized peasantry, felt disillusioned and frustrated with Soviet rule. Enstad situates this depiction of prewar Stalinist society in response to Steven Kotkin’s portrayal of Stalinism as something experienced (at least by Magnitogorsk workers) as “something hopeful” beyond the simple pragmatic tactic of “speaking Bolshevik” (that is, speaking as if they truly believed) and Jochen Hellbeck’s claim that “Soviet citizens were trapped in the all-encompassing ideology and language of Stalinism” (p. 30) and therefore had no outside frame of reference for articulating dissent. While accepting Kotkin’s and Hellbeck’s contributions to the study of Stalinist subjectivity, Enstad reminds readers that dissent in the Soviet Union was widespread, not only among the peasantry (and two-thirds of Soviet citizens were peasants), but also among urban workers, the majority of whom were frustrated that their standards of living had declined in the 1930s (p. 41). “A rising sense of injustice and exploitation,” Enstad explains, “even led some people to compare the situation to that which preceded the 1917 revolution, when the population was similarly humiliated; others began fantasizing, like the peasants in the countryside, about the downfall of the Soviet regime in a coming war” (p. 43). The lack of organized resistance by the late 1930s, Enstad argues, was not the result of great loyalty to the regime or the association of national sentiment with the Soviet state, but of “the impact of the extensive use and persistent threat of state violence” (p. 48). The ambivalence toward Soviet rule would have a strong effect on the way that the population received and understood the German occupation. On the eve of the war, predominantly peasant northwest Russia was a place “where large parts—probably a majority—of the population was virtually primed for cooperating with an invading power seeking to defeat and destroy the Bolshevik regime” (p. 51). Chapter 3, “Crisis: Parting with Soviet and Encountering German Power,” focuses on popular responses to the collapse of Soviet state control, the retreat of the Red Army, and the entrance of the German army. Enstad deftly interweaves two overlapping, sometimes conflicting strands of popular experience. Rumors and fantasies of impending war and the collapse of the Bolshevik state became reality, leading many to pin their hopes for a new life (one with material prosperity, the return of private property, and greater independence and intellectual and religious freedoms) on the German Army’s success. At the same time, many people in occupied northwest Russia began to see their own fates increasingly connected to the fate of the Soviet Union as friends and relatives were drafted into the Red Army, and as they began to experience the brutal side of German occupation, including mass executions, corporal punishment, and forced grain requisitions. Previously, historians have argued that the majority of Russians in the Russian Republic (RSFSR) of the USSR remained loyal to the Soviet State (for example, Kees Boterbloem, Life and Death under Stalin: Kalinin Province, 1945–1953 (Montreal: McGill-Queens University Press, 1999), in contrast to the more ethnically diverse regions on the western borderlands, including the newly-annexed territories of Western Ukraine, where Soviet rule was understood to be more precarious. Enstad shows that even in the northwest Russian countryside, the invading German army encountered expressions of gratitude and active cooperation despite persistent episodes of mass violence and coercion (p. 76), particularly because the Germans in most places in northwest Russia had allowed collective farms—understood as the greatest injustice of the Stalinist system—to dissolve spontaneously. Chapter 4, “Facing Annihilation,” looks at German practices of mass murder, including the systematic murder of Jews and Roma; the euthanasia or starvation of the mentally ill; and the inhumane imprisonment, forced labor, and intentional starvation of POWs. Enstad discusses in detail the tactics people used to survive in the face of German violence. The chapter confirms that Nazi practices of genocide and mass violence in northwest Russia differed little from other occupied Soviet territories. Chapter 5, “The Daily Bread and the Ghost of Hunger,” examines both external and internal factors leading to food shortages in the region. Despite the Nazi regime’s well-known politics of starvation on the Eastern Front, hunger resulting from unintentional shortages was often more pronounced and devastating. Local military administrators often attempted to mitigate the effects of shortages by reducing delivery quotas or allowing locals to migrate in search of food. At the same time, however, Nazi food policy was also laden with racist elements. Non-Russian nationalities—ethnic Germans, Latvians, Estonians, and Finns—received preferential treatment, including priority evacuation to regions with better food supply (p. 124). Enstad shows, however, that most Soviet citizens living under German occupation, including ethnic Russians, could improve their lot by cooperating directly with the occupation forces. Allying themselves with the center of power as Hilfswillinge volunteers (HiWis) or civilian employees of the military and occupation administration, individual Soviet citizens found ways to improve their standards of living and rise to positions of relative prominence in the native administration. Those who were savvy pitted Nazi occupation organizations against each other, by moving between various agencies to gain higher wages and rations, to the chagrin of the German administrations who tried (not entirely successfully) to curtail their mobility. Chapter 6, “Rural Freedoms and Labor Burdens,” shows how, despite the threat of hunger and mass violence, many parts of the Russian countryside experienced material improvement relative to the immediate prewar, and how that sense of improved well-being helps explain the paradox of why many former collective farmers continued to cooperate with the German authorities even after witnessing the brutality and mass violence of Nazi rule. Enstad argues that the complete dismantling of the collective farm system in northwest Russia (virtually all collective farms ceased to exist by September 1942, compared to only two percent of farms in occupied Ukraine) did much to shore up support for the occupation. 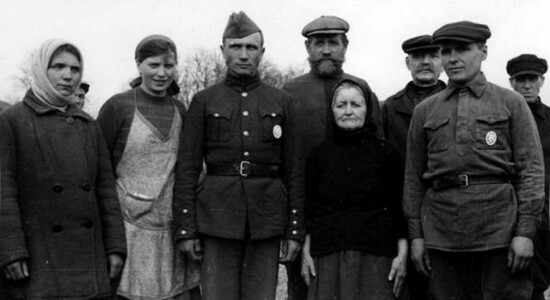 Because the Nazi occupation did not maintain full control of rural areas, peasants often found ways to work toward their own interests through creative accounting, pilfering, and hiding grain from the authorities. Yet whereas the elimination of collective farms contributed significantly to pro-German sentiment, later burdens, including increased grain quotas and the stalled promises of true privatization of the land, led to increasing ambivalence. Concurrently, the introduction of the forced labor regime in Germany, leading to the deportation of 50,000 people from northwest Russia to work in Germany as Ostarbeiter, caused great resentment among the population, especially as cheerful letters sent back home by the deported workers appeared not to be sincere (p. 165). Chapter 7, “Religious Revival,” one of the most fascinating studies in the dissertation, outlines the development of popular religiosity in the wake of the Soviet retreat. The chapter follows the activities of the Pskov Orthodox Mission, an institution established by local priests to minister to the spiritual and material wellbeing of the populace during the occupation. In contrast to the more draconian German occupation in Ukraine, the German occupation administration in northwest Russia allowed the church to play an active role in the region, to the point that the Pskov Orthodox Mission became a crypto-civil society within the Nazi occupation, in the absence of other representative institutions or media for the Russian people. This welfare arm of the Pskov Orthodox Mission was not only tolerated, but often even encouraged by German authorities on the local level (pp. 188-189). Enstad looks at issues of collaboration and opposition within the church, showing the complex ways in which Orthodox priests allied themselves with the German occupation, ostensibly as facilitators for German rule, while pursuing their own agenda to support the population materially and spiritually. Enstad shows how anti-Bolshevik sentiment—particularly the Bolshevik’s war on organized religion—led many Orthodox Church members to ally with the Germans, while the priests’ advocacy for Russian cultural and spiritual traditions in speeches, articles, and sermons could simultaneously serve as subtle anti-German messages to the faithful. Enstad tackles both Soviet and post-Soviet debates about priestly collaboration with the Germans, and argues that the majority of church leaders worked successfully as intermediaries in the interest of the Russian nation, but in opposition to the Bolshevik regime and the partisan fighters who were working to reestablish it. Chapter 8, “Relating to Power,” presents a framework for studying the everyday life of Soviet citizens during the German occupation. Casting aside the collaboration/resistance dichotomy and framing Soviet civilians’ experience in terms of “engagements with power” (p. 218), Enstad focuses, on the one hand, on the creation of what he calls “new avenues for action,” (the ability individual Soviet citizens found in the rapidly altering circumstances to influence their fates by engaging in various ways with one or both powers); and, on the other, on the “radical narrowing-down” of the space for action—the curtailment of possibilities for action in areas threatened by two violent claims for power at the same time (p. 217). The majority of people in northwest Russia, as Enstad argues, aligned themselves—formally or informally—with the German occupation until the return of Soviet control seemed inevitable, in late 1943. Yet while members of the native administration on the whole appeared, at least in the German perception, to be reliable partners in the German occupation, many of them were adept at pursuing their own interests behind the scene. As Enstad puts it, “Outward obedience and loyalty often went hand-in-hand with dissimulation and concealment” (p. 227). Enstad analyzes the complex web of interactions between horizontal and vertical networks, showing how sometimes a single village could be the home of both partisan fighters and German-employed village policemen, sometimes leading to respective families’ denouncing each other, but other times leading bonds of community, family, and kinship to trump the police-partisan divide. In some cases, cousins or nephews might be employed on different sides, creating a pacifying effect, and unofficial agreements not to fight each other. “Strictly local logics” (p. 232) often trumped the dynamics of the larger German-Soviet conflict. Most Soviet citizens only shifted their alliance to the partisans and Red Army in late 1943, out of a sense of “calculated pragmatism and power realism” (p. 218), not because of any greater ideological commitment or sense of Great Russian nationalism. Although the majority of the population publicly rejected the Germans by late 1943, they did not necessarily welcome and embrace the return of Soviet power to the same degree (p. 219). The return of Soviet control promised peace and the possibility of being reunited with family members, but the anticipated reinstatement of the despised collective farm system and fears of retribution for wartime activities led many peasants to dread the return of the Soviet system, and in the wake of material hardship and famine in the immediate postwar, many even criticized reinstated Soviet rule by comparing their lives unfavorably with life under the Germans. Soviet Citizens under German Occupation is an ambitious work, offering historians new insight into the regional variation in Soviet civilians’ experience of Nazi occupation. Enstad’s book promises not only to offer a rich case study of daily life during the war, but also significantly to alter our understanding of ordinary Soviet citizens’ responses to Nazi occupation and the restoration of Soviet rule. Moving away from the moralistic study of loyalty vs. treason, the book will offer an important corrective to Soviet subjectivity and “Stalinist civilization” studies by showing the limits of power and of either regime’s ability to the shape hearts and minds of ordinary Soviet citizens. University of Oslo. 2013. 356 pp. Primary Advisors: Knut Kjelstadli and Niels Bo Poulsen. Image: Sowjetunion, mit Sturmabzeichen ausgezeichnete sowjetische Freiwillige der Wehrmacht, mit Angehörigen; PK [Propaganda-Kompanie] 501: Two (presumably) Russian Wehrmacht volunteers, with decorations for bravery in battle, and their relatives. Creative Commons from the German Federal Archives.